Looking to enjoy more harmony and healing in your life? You’re not alone! I discovered that after a couple of years of suffering I needed to create a healing environment for myself. That’s when I started investigating feng shui. As there are many different principles involved in designing a feng shui office, I decided to hire a feng shui designer. We started with a plan and began with what we call intention. As part of intention, we put words of love, hope and healing on the floors underneath the flooring to create this intention. The next thing we did was to use proper colors and images to create the visual space that we wanted. We also used music to create a pleasing auditory effect. In feng shui, stones and crystals are used to get the energy in the office to create what’s called a Zen environment. 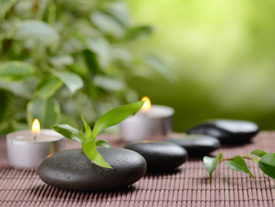 We wanted to create a Zen type of environment to help the body heal. Over the years, we found that there are a lot of different mechanisms for healing and a lot of them are vibrational — meaning from seeing or sounds. Sounds or energy can be considered vibrations. To help bring the whole concept to life, we put all of that together in the office and trained our staff to demonstrate loving, caring and compassionate communication skills. When you walk in the door, you’re immediately struck by the beautiful pictures in the reception room. A lot of people say they feel very peaceful. They feel very supported and comfortable being here. It puts you in a position where you can accept love and love is the energy of healing. Love unlocks the trap door between your educated mind and your innate mind or your universal mind. The love that happens is the result of creating an environment where people feel cared for; they feel compassion, and they feel love. Dr. Elliott Grusky, author, physician, philosopher and teacher presents to you this unique, experience. A sacred space, a special place, a healing space. The feng shui design of the clinic,enhances healing by creating the environment best suited to promote optimal Brain – body function. Through visual, auditory, kinesthetic (movement) and emotional stimulation, the impact on the body, mind and spirit is powerful. The design uses symbols and materials to create this energetic presence. This space was created with intention, Love, and the desire to experience the ultimate healing environment, this is now our new home. We invite you to participate in the journey of health and healing. Our wonderful staff is there to assist you with all of your needs.